There is no formula or equation for how I balance work and focus with fun stuff in my studio, because they are one and the same. The fun is how the work gets done. When you think about things from the right frame of mind, even something as serious and dull sounding as note stem rules can be made seriously fun. Time for a not-so-elegant mnemonic. You ready? This plan of action will put fun and games to work for you. It will help you to make the most of every single minute of lesson time you have available. Gap is my all-inclusive term for anything you want to teach to your student. It could be something they’ve not encountered yet, a new level to add to old information, or an error you’ve noticed in their playing. This is the missing trick for many teachers, I know it certainly was for me when I started. We want to jump from thing they don’t know to…them knowing the thing. But there might be connecting parts. Is this concept or idea something that they have the proper foundations for? What are all the steps along the way to true understanding? When you’ve done all this planning and mapping of a good route – with some amazingly fun stops on the way – you need to let it unfold with your student. Become the furiously paddling swan and don’t let the signet know that you’re guiding her towards to solution. She needs to discover it for herself. Avoid telling your student. Children learn through play. Give her the opportunity to mess around with and experience the idea before you boil it down to a definition or a term. Remember, your job is to facilitate your student’s learning. Some students see a ledger line and just…FREEZE. What is that ugly looking thing? 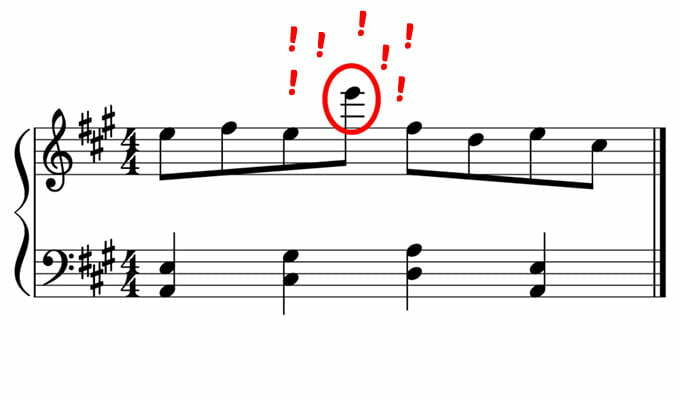 How on earth are they supposed to remember what note that’s supposed to be?! But we don’t want them to “remember” these notes. Not really. We want them to understand how the staff works, that this is just an extension of the same system. If they can’t see it that way, then there’s a disconnect happening. And it won’t be fixed by telling them what this particular ledger line note is. Understand what ledger lines are. Be able to “use” ledger lines. Connect the dots between the entire grand staff and the ledger lines. Have a reliable system for working out ledger line notes when they come up. We could just have jumped straight to that last point. But that would be just be a temporary fix. Not understanding ledger line notes is a symptom of a bigger issue: not understanding the staff. If we just cover over the symptom – it’s going to lead to big problems later on. 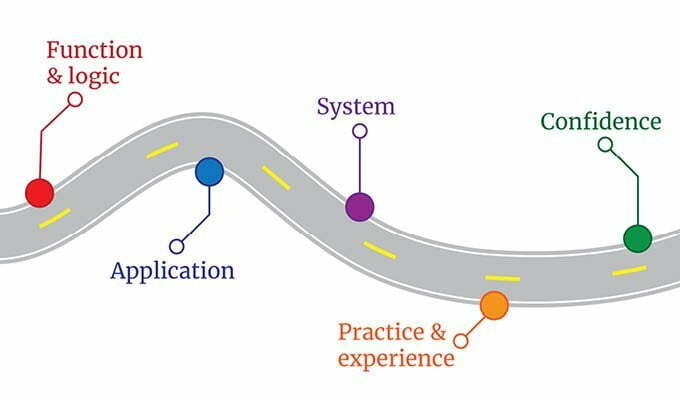 Since we understand the exact nature of the journey we need our student to take, it’s easy to plan activities that will lead them down the track. 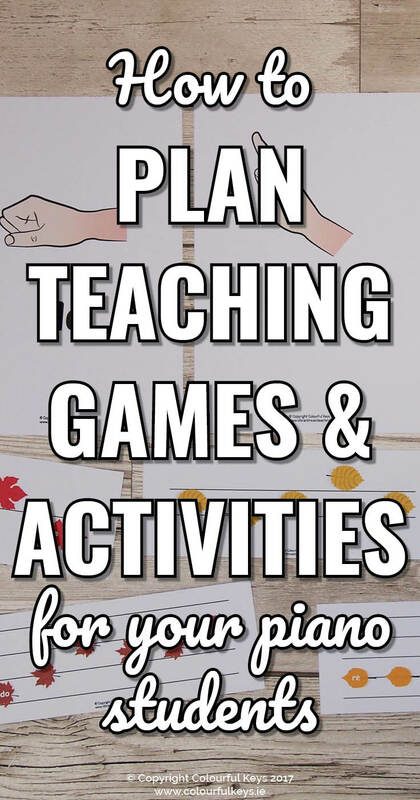 Get your student to draw a staff on a piece of paper or small whiteboard. 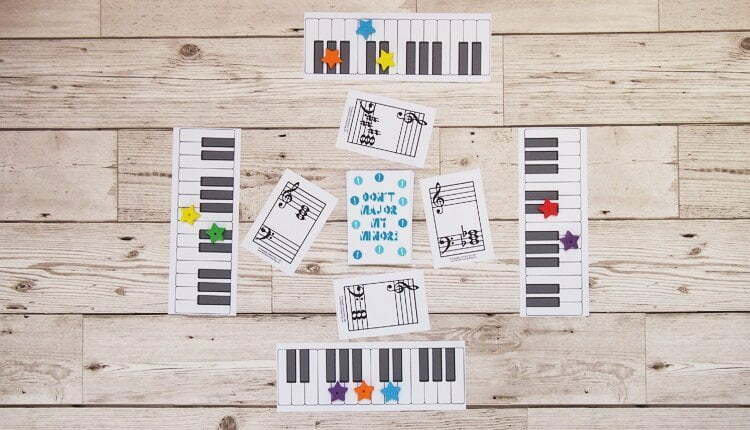 Play one note at a time starting in the centre of the piano with B and D.
Ask your student to draw the note and write the note name in the centre for each note you play. When you get to low F and high G, just keep going and observe what your student does. She may draw the ledger line without assistance, she might just draw a note with no line, or she may just stop and stare at you. Ask your student questions to guide her towards the correct way to draw this note – then continue going to higher and lower notes until you’re sure she gets how the system works. 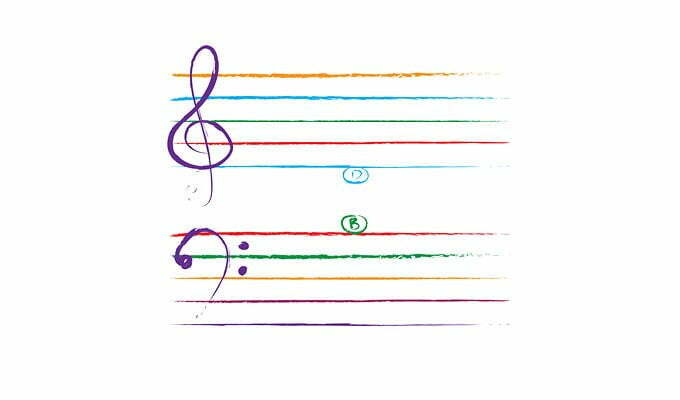 Take a sheet with the note names arranged in a line, and a clef, but no staff lines. 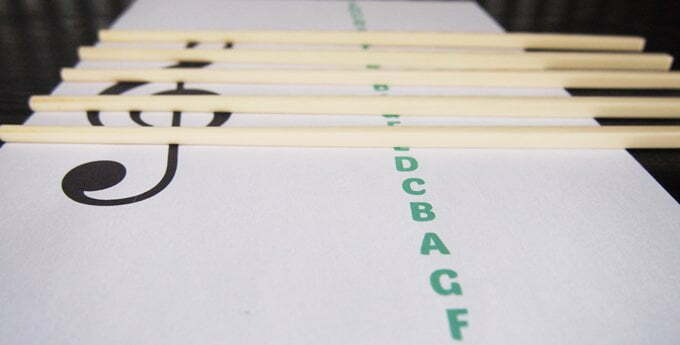 Ask your student where the chopsticks should go to make the lines of the staff. Help her as needed and take out some sheet music to use as a reference if she’s struggling. Once she has her chopstick staff ask her about those other notes floating outside the lines. What does she think we need to do to give those notes a home? This is where the plasticine comes in. Roll out a little plasticine line and place on on a floating note. Have your student make lines for the rest of the floating lines. You can find a more detailed post about this activity here. Now that your student “gets” the staff, she’s ready for Legend of the Ledgers. This is a game that will further emphasise the relationship of the treble and bass staves, and all the ledger lines on top and underneath. Students move around by interval and get plenty of practice naming ledger line notes. 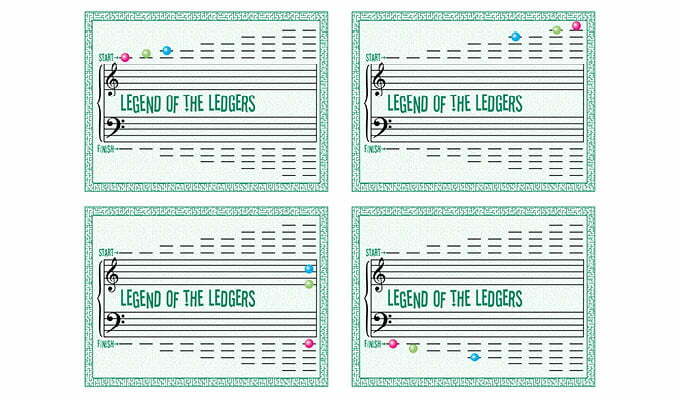 Legend of the Ledgers is only available to Vibrant Music Teaching members. Find out more about membership here. The final ingredient you need for ledger line success is speed. Get your students into the 60 Second Challenges and they’ll be pros in no time! First you need to know why you want to teach your student about chords and their inversions. Is it for a theory exam? So they can identify them in their pieces? So they can play leadsheets? We’re going to take that last instance as our example, but any of those are valid aims. Just don’t head towards all sides at once. Pick one destination and the rest will come with time. 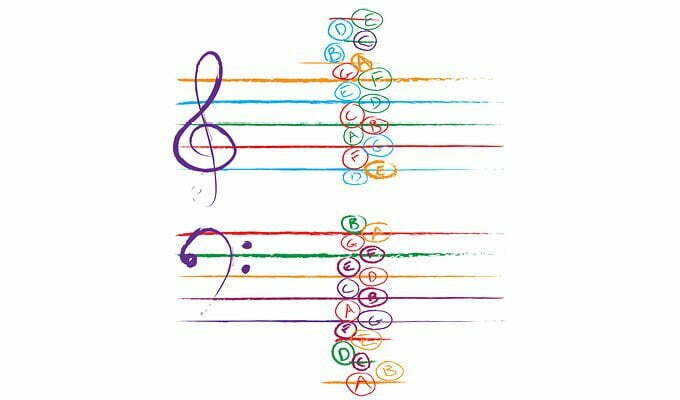 If our goal is for our student to be able to use chord inversions in their leadsheet playing – we want to focus on the shapes at the piano more than the written notation. Inversion construction at the piano. The emphasis on patterns of semitones, rearranging and pattern recognition will mean that it’s easier for your student to find the shape they need under her hand. It’s time to plan some activities that will help your student move from vague notions of chords to leadsheet playing superstars. After the initial understanding of the 4 semitones – 3 semitones pattern is in place, your student needs lots of practice with just major chords. My favourite way to do these kinds of drills is with an app called iReal Pro. This is a super flexible backing track app that’s available on pretty much every OS. We use this to drill first all the white key major chords, and then all the major chords. My students love choosing the different backing track styles and challenging themselves to go faster each time. This is a game for practice major chords and also their relationship to the minor chords. Combined with the practical drills at the piano, our student will be well on the way to knowing the root position chords back to front in no time. Don’t Minor My Major is only available to Vibrant Music Teaching members. Become a member today here. 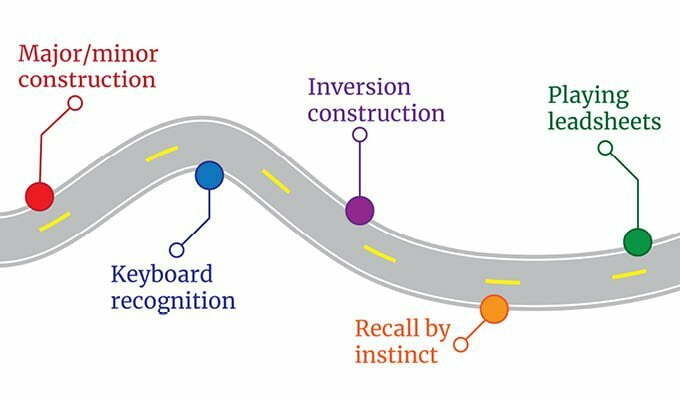 When it comes to inversions, I like to start with keyboard mapping. I ask my student to create a chord on the piano, using erasers to mark it out. Then I move the bottom eraser up to the top to create the first inversion – and ask my student what I’ve done. We talk about how this works, and play lots of inversions and root positions so she can hear how they sound the same, but different. After this we do a few minutes of practice at each lesson going forward, mapping out chords in various positions all over the piano. After a couple of weeks of this training, our student will be ready for this finicky but fun game. 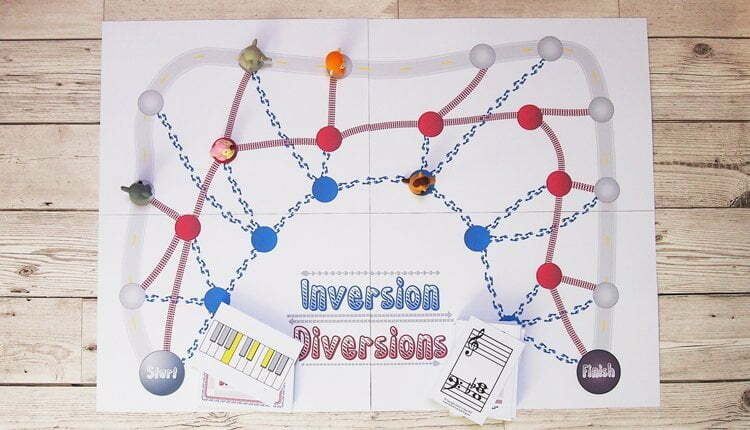 Inversion Diversions has options for keyboard pictures or staff versions of the cards and students have to identify the chord correctly to move around the board. The inversions are emphasised by the fact that they have to switch paths based on which type of chord they drew. Inversion Diversions is only available to Vibrant Music Teaching members. Find out more about membership here. 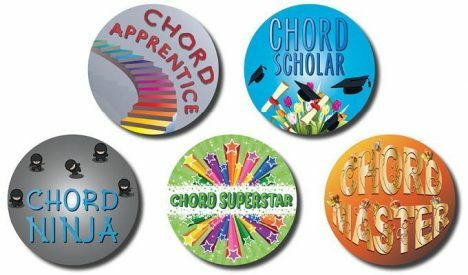 After this initial knowledge is in place, you might like to inspire your student to extra practice of chords using my challenge posters and stickers. Do you think you could try this in your own teaching? Let me know what you think of my approach to planning effective theory teaching in the Vibrant Music Studio Teachers group on Facebook or in the comments. Your 60 second challenge is like my 10 note challenge scheme. 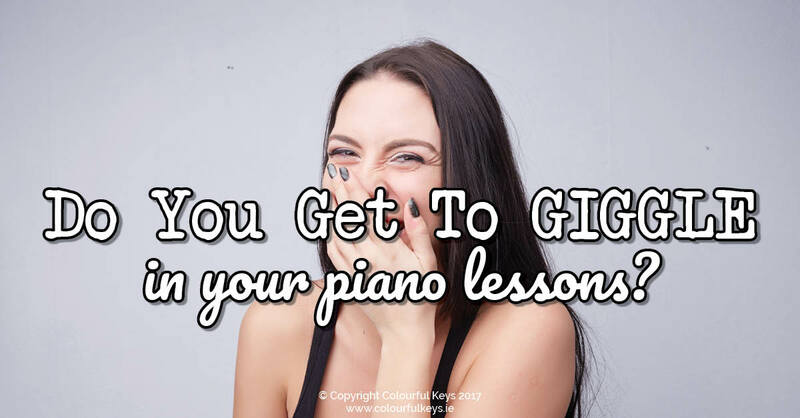 Stage 1 is naming 10 notes on the keyboard played by the teacher in 10 seconds, stage 2 treble space notes (after naming students then name and locate without being timed) etc. Certificates are awarded after meeting each challenge 3 times. Another game that I have been using for years is what my students refer to as the Dice Game. We roll a dice and race to put the correct fingers on the table (hands on head for a 6).